Twelve Bees Handmade Goods: Quilt "You": What's Your Spark? Quilt "You": What's Your Spark? As I quilt, I think. Without even realizing it, even with Netflix on in the background (I'm the tiniest bit ashamed/not ashamed at all to tell you that I've been binging on Dawson's Creek for the past couple of weeks), my brain is constantly cycling through ideas. Ideas about this quilt, future quilts, other projects, my family, my kids, friendships, real life, plans for the future, Dawson and Joey's on-again-off-again drama (ha). I've heard runners say that running gives them time to think; for me, quilting is the time when the noisy world goes quiet and I can focus only on what's in front of me: colour, pattern, lines, matching (or not matching) corners, and let my mind drift off to wherever it wants or needs to go. 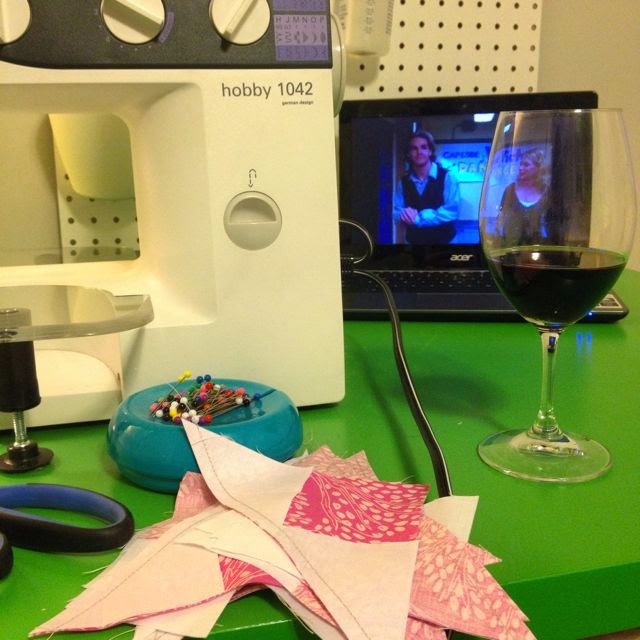 My first line in this post should have read that as I quilt, I drink. And watch Dawson's Creek. What? 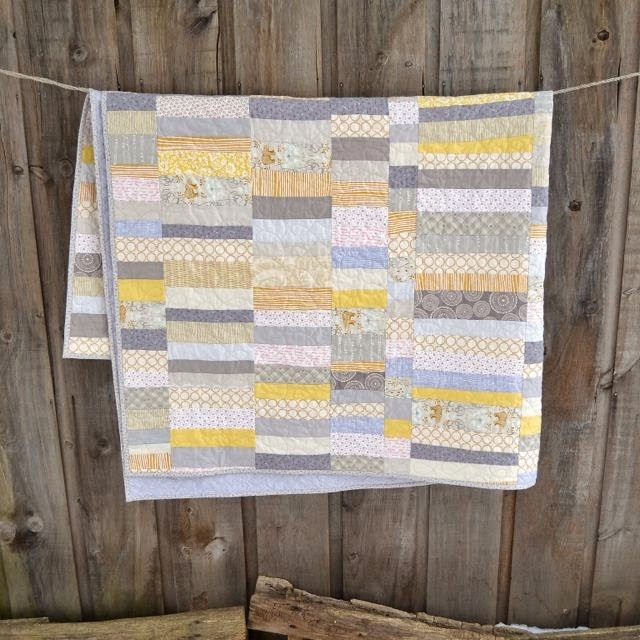 One of the ideas that has been swirling lately is the concept of why I quilt, and what it is that draws me in and keeps me engaged in a creative project. Is it just to have a beautiful warm blanket to wrap up in at the end of the day? For some people, maybe, but for most of us it's about a lot more than that. It's art, it's how we express ourselves, and how the quilt we end up with is the culmination of a thousand little decisions that we make over the course of its making (that colour there? which block? improv or planned? is that too wonky? is that blue too blue? not blue enough? is that value ok beside this one? stop now or make it bigger?...). And the beautiful thing is that each of us would answer those questions differently, which is what really makes our quilts our own. Is that blue too blue? While I don't want to get too "Deep Thoughts" on y'all, I do believe that it's a good idea to reflect on our own creative processes once in awhile. By reflecting and "listening" to what excites us the most, and by following those sparks, we allow ourselves to develop a style that is uniquely our own and therefore make things that are truly a reflection of our creative selves. And, really, aren't the most beautiful things made when you can tell that somebody is really just doing what they love? I feel like this process of creative reflection is especially relevant in the age of Pinterest and Instagram, through which we're constantly bombarded by images of incredible, beautiful things on a daily basis. So how can we be inspired by our quilty community while maintaining and developing a unique personal style? With that in mind, I've tried to make a point lately of being conscious of what parts of quilting make me the most excited. My thinking is that if I can identify my "sparks", and let them lead my creative process, I will follow them down a path that is not only fun but also uniquely mine. I want to quilt "me". 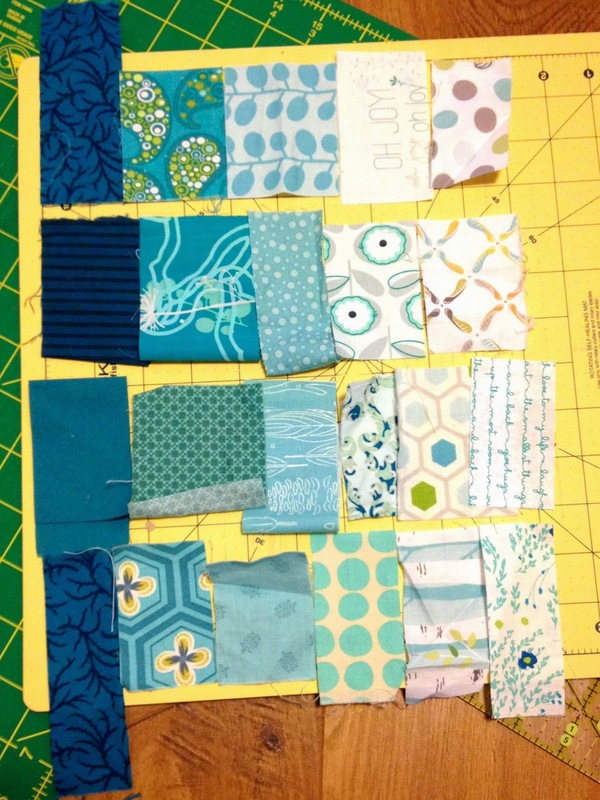 I like not knowing exactly what my quilt will look like before I start. Carefully planned and executed quilts don't excite me. I have the most fun when I get to play with layout and placement, and make decisions constantly throughout the process. One of the most fun quilts I've made - semi-planned, scrappy goodness. In a similar vein, I don't especially like following a pattern. I recently bought my first quilt pattern. Don't get me wrong: I love the quilt - it's stunning, and I know I will love the finished product. But it just doesn't feel like "me". For me, quilting is more often about the process than necessarily the finished product. I've found the repetitive process of precision piecing to be, honestly, kind of boring. I started making the blocks a bit scrappy just to liven things up a bit. I think that tells me something important about my style. 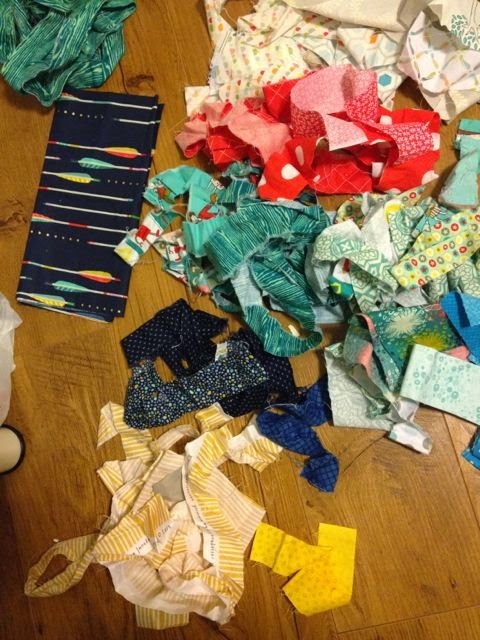 While I consider myself a "modern" quilter, I am drawn to many traditional blocks, especially stars and flying geese. I love me some flying geese! Note to self: more geese. Some random piecing up on the design wall. Note to self: more improv! Listen to your creative voice while you work. If you find something tedious, take note: why? is there a different way of doing it that would be more exciting? If your heart skips a beat, take note! A colour combo you love? A cool new technique? Curved piecing? Low volume? What is it that makes you excited? Do more of that! What are your sparks? 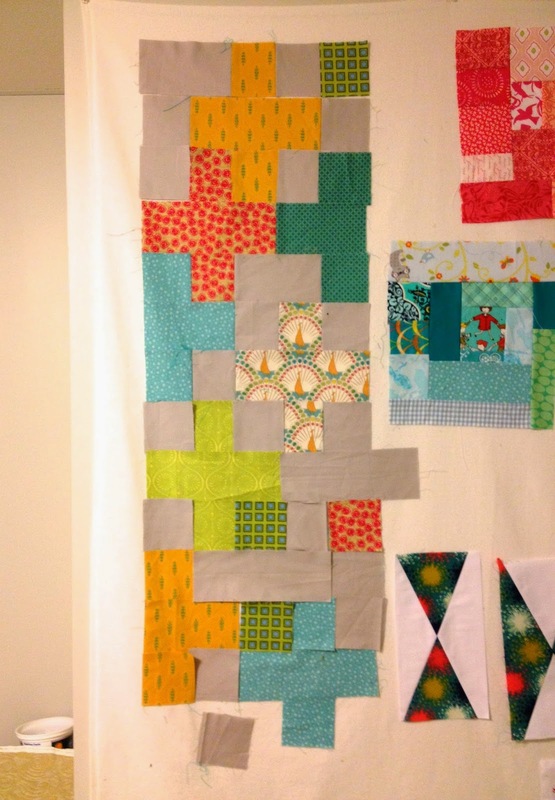 What excites you the most about the creative process of quilting? How can you quilt "you"? Now I just have to learn to take my own advice. I'm Becky, and I love to sew! Twelve Bees is me - making modern quilts, sewing, and creating in our little home in Ontario, Canada. Organic baby carrier drool pads = Etsy madness! All content is copyright Twelve Bees. Please ask before using my images or content elsewhere. Simple theme. Powered by Blogger.